Smart Cities contain thousands or even millions of sensors that collaborate to provide citizens an interactive infrastructure according to their needs, based on their preferences, time and geospatial constraints. Therefore a vast amount of information is exchanged. Therefore, this information should be encrypted, in order to provide the necessary secrecy. In pay-per-usage services for example, we want to ensure that users can access data only during the period of their subscription.Consider that users U1,U2,…,Um want to access real-time traffic data service. In a naïve approach, a Key Distribution Centre (KDC) shares a separate key with each user. The KDC has to make m encryptions of the group key and send it to the according Ui. What happens when a new driver joins or leaves? New users must not be able to have access to the old keys (backwards secrecy). Also users who left the group should not be able to decrypt the current content (forward secrecy) and any subgroup of users should not be able to recover the key of another user (collusion freedom). The KDC has to update the key each time. Practically, send m new messages on each occasion. If the key is 128bits and one AES encryption takes 0.0001 seconds, then for 100,000 users the server takes around 10secs to make calculations and sends around 1MB of data (without taking into consideration the rest of the headers). This is needed every time a user joins or leaves the group. 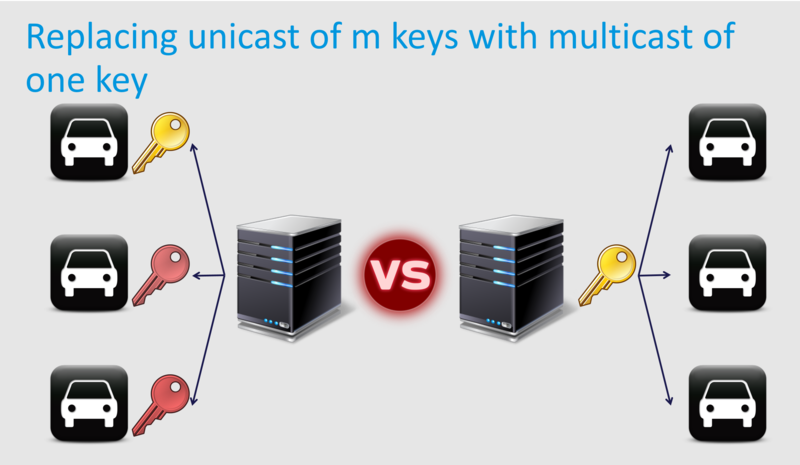 The proposed scheme replaces the unicast of m key by the broadcast of a single key while maintaining the backwards and forward secrecy, and the collusion freedom. 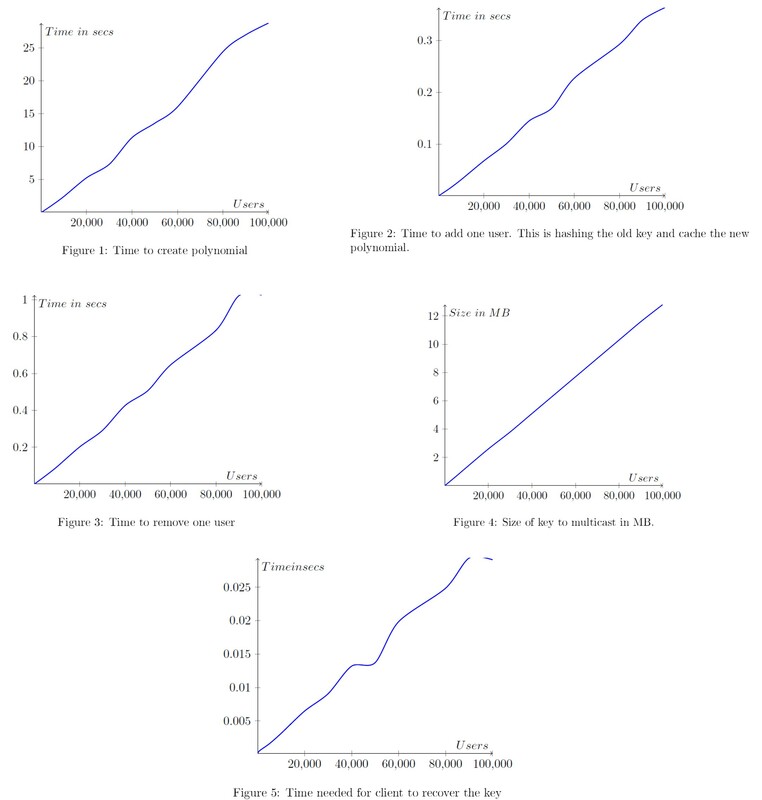 The proposed scheme offers easily parallelizable, linear growth of the time cost according to the number of users, one second overhead for the server to update/cache the key and Client can recover the key in milliseconds. This demonstrates the feasibility of a scalable centralized group key management scheme for city-scale infrastructures.